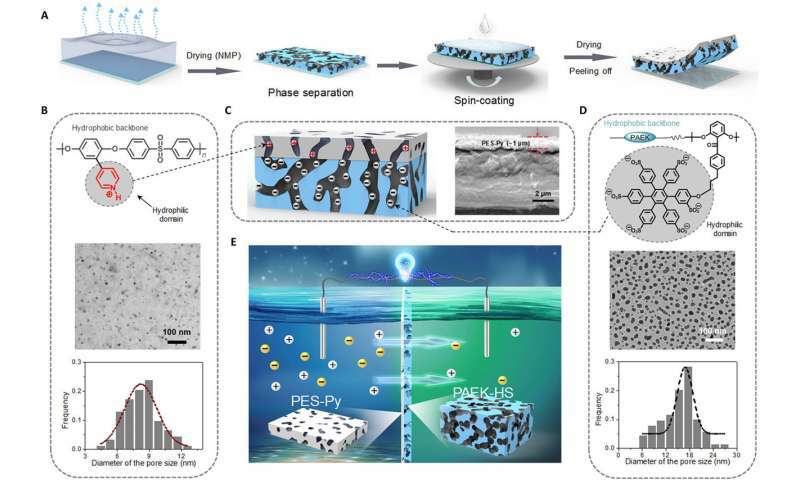 A team of researchers from Jilin University, Beihang University and the Chinese Academy of Sciences has developed a more efficient membrane-based generator for harvesting osmotic power. In their paper published in the journal Science Advances, the group describes their generator and how well it worked when tested. Scientists have known for some time that it is possible to generate electricity by osmosis through a membrane situated between two bodies of water with different salinity. Prior research has shown that it is possible to create such a generator, but problems have prevented its use for real-world applications. In this new effort, the researchers report that they have overcome previous problems and created a generator able to power a calculator. The osmotic differences between salty and freshwater allow for the generation of electricity—the process requires a membrane that allows one-way passage of the water. Prior efforts have fallen short due to the need for extremely small pores—such small pore sizes have required a large amount of pressure to get the water to move through the membrane. In this new effort, the researchers have overcome this problem by using Janus materials to create a three-dimensional membrane that is porous and has a tunable surface charge. The device was made by creating a double-layer membrane of two kinds of plastic—one layer had a negative surface charge, the other a positive surface charge. The two layers were combined using a wet-chemical process followed by drying. The final membrane was approximately 11 microns thick with pores ranging from 8 to 17 nanometers in diameter. In their configuration, charged ions with one polarity passed through the membrane, while those of the opposite charge could not pass through. The result was a net current flowing in just one direction, preventing it from flowing back into the membrane. Testing of the membrane showed it was capable of generating 2.66 watts per square meter. The efficiency was measured at 35 percent. In their demonstration model, the membrane was capable of powering a calculator. The researchers point out that the membrane can be made larger, to scale up for generating larger amounts of electricity. Increasing the salinity would also make the generator more efficient.